Aaron Altherr, in his second rehab game at Double-A Reading, reached base in each of his first three plate appearances on Friday night. He will likely rejoin the Phillies next week. Aaron Altherr’s official rehab assignment comes to an end on Wednesday. Major league position players can spend no more than 20 days on a rehab assignment, barring a setback. A player like Altherr, who still has minor league options, can still be optioned to Triple-A Lehigh Valley to continue get at-bats once that period expires, however. Despite missing the season’s first four months following wrist surgery, Altherr looks he’s in good enough shape where all of those dates, timelines, and options may not apply. He looked major league-ready in Double-A Reading on Friday night. 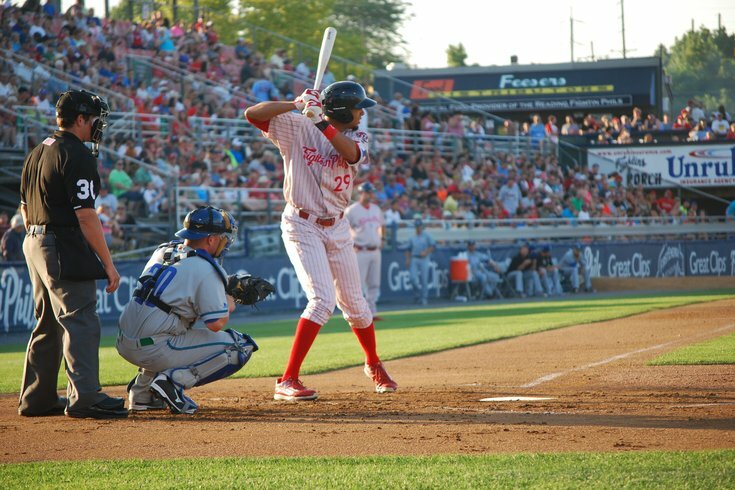 Leading off and playing right field for the Fightins, Altherr singled on the first pitch of his first at-bat, stole second, and scored the game’s first run on a single from Rhys Hoskins. He reached base in three of his next four plate appearances, too, with a walk, a hit by pitch, and another single. 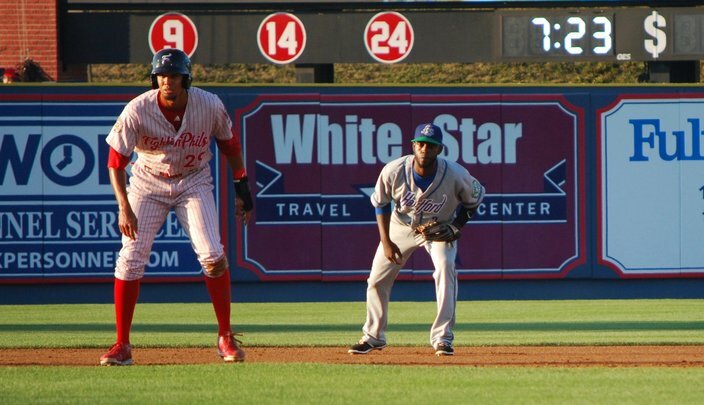 Altherr's second hit led off the ninth inning at FirsyEnergy Stadium. He went on to steal his second base of the night before scoring the game-winning run on Jorge Alfaro's walk-off double later in the inning. Altherr is likely to rejoin the Phillies when they arrive in Atlanta for the third leg of their current road trip on Thursday, if not sooner (they play in Miami for the first half of the week). Does Altherr expect to be activated when his time is up after Wednesday? Altherr, 25, was in line for the starting right field job with the Phillies before injuring his left wrist on the fourth day of Grapefruit League games during the first week of March. Altherr tore a tendon that required surgery; his recovery time was an estimated 4-to-6 months. Aaron Altherr stole second in his rehab start. After opening eyes in the final six weeks of the 2015 season, Altherr’s injury was bad timing all around (not there is ever a good time for an injury, of course). Mackanin called it a “big blow” for the organization. “Not that he was an established player by any means, but he showed enough to where we know how good he was defensively and we know that he’s got power, we know he can run,” Mackanin said of Altherr, who hit .241 with an .827 OPS, five home runs, 11 doubles, and four triples in 39 games with the Phillies last season. Altherr didn’t waste much time feeling sorry for himself. When the Phillies departed Clearwater in late March, Altherr stayed behind and began a lengthy rehab. He cleared an important hurdle in mid-June, when he began taking regular batting practice. He began playing games with the (talent-rich) Gulf Coast League Phillies two weeks ago. Altherr suffered the other wrist injury, on his right hand, three years ago in the Arizona Fall League. It also required surgery. The previous experience helped him stay patient this spring. Altherr is there now. But what was he doing in March, April, and May? Keeping another important baseball muscle sharp: his brain. “I always like to watch baseball games and mentally put myself in the batter’s box during the game,” Altherr said. “See what I would do, mentally, with a certain pitch or pitcher, think about what he’s going to throw to a guy in certain counts. The Phillies will likely look to trade one of their veteran outfielders (soon-to-be free agent Peter Bourjos make the most sense) prior to the August 1 trade deadline. If a deal doesn’t come to fruition, they could just as easily replace rarely-used reserve outfielder Jimmy Paredes with Altherr on the active roster. Rhys Hoskins just hit his 28th HR of the season. No one at any level of professional baseball has more. (Trumbo, Frazier also have 28). Update: Trumbo hit his 29th home run on Friday night in Baltimore. This is Dusty Wathan's 351st win at @ReadingFightins, making him the long-time Phillies affiliate's all-time winningest manager. Congrats.